When a master of any particular genre returns to it, it’s usually to the satisfaction of the fans of that maestro or the genre. Thankfully, such was the case with the 2004 film, Collateral. With director Michael Mann returning to Los Angeles with another crime thriller, using a fine script by writer Stuart Beattie, it’s the fans of both the director and the category of film that reaped the benefits. As well, Mann-aficionados will appreciate him coming back to this familiar tuft without attempting what is now the movie studios’ brain dead pastime of re-making successful original work. Luckily, this was not a regurgitation of his great 1995 ensemble crime saga, Heat. Collateral brings a more intimate, confrontational drama to bear, played out across the nocturnal expanse of the ethnically diverse L.A. landscape. Whereas Heat had two groups, nonpareil criminals and an elite police group, directly facing off, here law enforcement is on the sidelines. Always a step behind and waiting to pick up the pieces of this two-man conflict. Even when one sharp LAPD street detective starts puzzling it together, the director unleashed an unanticipated volte-face that quickly told the audience he was not about to repeat himself. The wonderful clash of opposites and contrasts offered up in Stuart Beattie’s script is the film’s strength. The screenplay is played out in one January night, across the backdrop of empty streets among a city of lights. Michael Mann paints, in his textured visual style, the confrontation of one, out-of-town hired killer and the hometown cabbie that is ‘recruited’ to drive his passenger on a night to close some “real estate” deals. For the most part, it is an interior cat and mouse tale played out along the various sections of this sprawling city. All the while, delivering its complex, almost existential dialog between the two principals mostly within the confines of a claustrophobic taxicab. Throughout, both director and screenwriter drive the story with the antithesis of the lead characters. The movie belongs to Tom Cruise, in a rare villain role, and Jamie Foxx, in an early break-through performance before the movie Ray eclipsed everything. However, I don’t want to shortchange the very good cast that is in support of these two — populated by a cadre of Mann’s regulars and newcomers. Among them, actors Jada Pinkett-Smith and Javier Bardem (in an earlier, more subtle villain role that preceded his more flamboyant turn in No Country For Old Men) are standouts. As well, the always dependable Barry Shabaka Henley and Mark Ruffalo make substantial and notable contributions when their characters are on-screen. Cruise’s contract killer, Vincent, brings all of the things Tom-the-hero is known for. Though, in this case, his traits are swung over to the dark side. Where he’s been motivated to save the day in other films, here he’s the highly skilled, disciplined hired assassin making good on those his cartel employers want dead. He’s way more intriguing in the role than say Jason Statham ever was in the 2011 remake of The Mechnanic (you’ll note Statham had an early cameo in this film’s opening airport scene). Cruise’s typically American smart-alecky charm is now applied in a great, subverted manner. And, that produces a sinuous and sociopathic effect whenever he’s in a scene. You have to admit, from Top Gun to the The Last Samurai, the actor is at his best when he’s a bit nuts on-screen. Well, as long as it’s restricted within his films, that is. Since its release, I think many now realize his was a performance that should have at least garnered him an acting award nod (while Jaime did and he did not). Here, he’s the out-of-town traveler on business; a master of calculated improvisation within his grim profession. Vincent is unphased by trouble from whatever direction it comes. Yet, he has a keen eye for exploiting weakness. He’s a true Darwinian creature. And the fact that he’s no fan of LaLa Land, either, only adds to the mayhem he brings. His character is about as caring as an anti-personnel mine. The problem he’ll face on this night, though, will be in choosing someone like Max for his chauffeur. Foxx’s Max Durocher is just about everything Vincent isn’t. He’s a ‘people person’ to a degree, who drives the cleanest cab anywhere in the city (perhaps, even in the country). Max suffers, though, from the very bad combination of being a perfectionist and the complete opposite of a risk-taker. He’s a safe, stay-at-home kind of guy. A conjunction that breeds not a ‘has been‘, but a ‘never will be‘ type of personality. Jaime, who can be one of those chameleon-like performers, with the right direction, brings the underachiever Max a too recognizable life with viewers. As with his notable first turn with Mann in Ali, he seems most comfortable when he’s in with a strong director and script (as my colleague J.D. contends). Some of his best work has occurred under this filmmaker , in fact — Ali, Collateral, and Miami Vice were Mann-directed, along with The Kingdom, which was executive produced by him. His character in this film is just happy to get by, filling his customers heads (as well as his own) with his future endeavors. He is nonetheless striving to be the best among those that never take a chance — lying to himself about why he’s still driving a cab after twelve years of getting ready for his big career move. He’s the opposite of the Alpha Male, “meat-eater super assassin” who’s sitting in his cab’s rear seat. Foxx was a revelation in the film, at the time. The only thing Max has in common with his passenger is that he’s going to experience the worst night of his life, too. And the fun in this confrontation (and for us) is that Michael Mann will bring it to a head in only the way he knows best. This director’s style is today a well-known attribute: exquisite plotting, cinematography, peerless music selection, and craft. I agree with film critics Roger Ebert and Richard Roeper on their point, when they reviewed it on the TV show [paraphrasing] no one films the Los Angeles cityscape better than he. Though, I must admit now Nicolas Winding Refn expanded that list in 2011 with the exemplary Drive. Collateral‘s use of night photography was especially effective, as seen through Dion Beebe and Paul Cameron’s high-def digital video camera. Its use was refined to a greater degree with 2006’s Miami Vice (see my good friend J.D.’s wonderful review of that misunderstood movie). The use of digital video brought an eerie clarity to the nighttime proceedings. The spectral views of the various neighborhoods and aerial shots only added to the beautiful contrast already in this film. As did Refn’s Drive, the film blended particularly well with a mesmerizing music soundtrack. Add to this, Mann’s penchant for deftly displaying the dark tradecraft of violence. He is one of the few that can deliver a fine action sequence without losing his or the audience’s way. And, his staging in the Club Fever clip is another one to behold and enjoy. If for no others, those like me who appreciate these kinds of things. No surprise, given the director’s long-time preference of using real experts as technical advisers and actors in such segments — and it shows with the gun craft and skill showcased throughout the film. Michael Mann remains highly proficient in his ability to visualize professionals on-screen, on either side of the law. Quite simply, Collateral is another of the filmmaker’s great, suspenseful thrillers. Now that some years have passed since its initial release, I don’t think it’s too early to say that the film has stood the test of time, much like his masterwork, 1995’s Heat, which in my opinion was one of the best films of the 90s. Like that feature, his use of the city of Los Angeles as a character and his stage succeeded to great effect. While he brought the story’s cold, brutal acts of violence in startling detail, the real effects of them, in this Mann-Beattie collaboration, in truth impacted primarily upon the two lead characters tied by fate. While only one is supposed to end up as collateral, neither was granted immunity in the story. Heat begins on a subway and ends at the airport, while Collateral begins at the airport and ends on a subway. Perhaps, this was a fitting touch of symmetry by this director? God, I hope not — I want him back shooting another crime flick in my hometown. Note: this was a reprise and an update of an old review I first did on the film in 2005. Wonderful piece. You certainly opened my eyes to the finer points of the film which I enjoyed when I first saw it. I do have a soft spot for films that take place in short spaces of story time and Collateral definitely succeeded in hitting the right notes. Yes, for the short time they are together on this one night, the characters in this setting are a compelling twosome. I agree that this film hits the right notes. Thank you for the kind words, Dan. Fantastic review, Michael! The Mann has done it again… I was thoroughly impressed Collateral and he brought out such a chilling performance out of Cruise who’s normally playing heroic roles. LA has never looked so mysterious yet charming, and that’s interesting about the use of public transportation in Mann’s movies, I never noticed that before but that’s so true. That scene after the jazz lounge is just wow, it literally made me jump out of my seat. Jamie Foxx was equally effective, and Javier Bardem also turned in a memorable performance. Overall it’s a great crime thriller! You’re very kind, as always, Ruth. I do admire it when someone goes against type and turns in a great performance like Cruise did here. Everyone I know points to that jazz club scene as pivotal (BTW, that club is no longer there in Leimert Park — I know this because I don’t live far from that area and my daughter’s schoolmate’s family lives a couple of block away). Bardem is quite chilling in his moments, too. Many thanks :-). wow…what an impressive and detail post, Mike. I wish I can write this detail too on a movie. You’re very kind, Novroz. And yes, even folks that don’t like Mr. Cruise find his performance exceptional. Thank you very much, my friend. About the only film I can watch with the poison dwarf in…. Cruise was actually pretty good in this one. That would certainly be intriguing, Ronan. Ha! Love the quote, Scott! And yes, after seeing this one, it makes seeing something like ‘Drive’ a must. Many thanks, my friend. I love the aesthetic Mann creates in Collateral. And Tom Cruise is electrifying. I wish he would play more bad guys. Thanks for this Michael. Great comment and observation, Ronan. What did you think of Cruise as the vampire Lestat in ‘Interview with the Vampire’? Thank you, my friend. Excellent review and thanks for the shout-out, my friend. This is a tight, contained film and I love how Mann, like he did with HEAT, photographs sections of L.A. not normally seen on film. He also shows how diverse a place it is ethnically, which is also qutie interesting. Great to see Cruise delivering a rare bad guy role. I know he took some coaxing but, man, does he deliver the goods. After he kills those guys trying to rob Foxx, I pretty much forgot it was Cruise as he disappeared into the role. The only issue I have is that the ending is a little weak with the cat and mouse game in Jada Pinkett Smith’s office building a little unbelievable, in particular, how she reacts to Cruise coming after her, but otherwise this is an excellent film. Your review really does its merits justice. My pleasure in sending out the link-love, J.D. I love spreading the word of your articles on Michael Mann films. Mann has a marvelous touch with ethnically diverse areas like L.A. and Miami, and it shows in his films. Love that scene, too! When Vincent says, “Yo homie… that my briefcase?”, you know something unexpected is coming. His walkaway coup de grâce on the robber takes your breath away, too. I see your point about JPS in the office building. It’s a fair one, alright. Many thanks for the kind words and spot-on comment, J.D. Great review, Michael! I liked this film quite a lot and your review has inspired me to watch it again. Speaking of Mann… in a really weird coincidence one of the buses I was riding in Peru showed HEAT (This was after Rango and before Cars 2 – I assume it was some kind of a joke to through HEAT in between those or maybe that’s what families riding buses want to watch in Peru:) so I got to see it again just like I was saying I needed to. The reason I wanted to re-watch it is all the recent posts I’ve seen talking about how great it is. I remembered not liking it when I saw it and wondered if ~10years would change my mind. Turns out, no. In fact, I liked it even less on my second viewing. Craft-wise I have no problem with the film (I, too, think Mann is a wonderful director) but I didn’t like the story or the characters. Not much to hold onto after that… But oh well, there are certain stories and archetypes that never appeal to me and HEAT happened to embody most of them. Hey, welcome back, Rachel! Hope your trip went well. Thanks for the kind words about the piece. Wow, what a triple feature! Must have been a long bus ride ;-). Sorry to hear that ‘Heat’ on re-watch didn’t do much for you. But, at least we have ‘Collateral’ to share. Many thanks for the comment and your return, Rachel. p.s., I’ll be watching a certain movie tonight (if Netflix finally delivers it). Thanks! Always good to go on trips but always good to be back. 🙂 It was a long bus ride but I don’t think it actually saw the end of Cars 2… I wasn’t really watching anymore at that point. I just re-watched a certain movie myself. Can’t wait to hear your thoughts (hope they weren’t: bored, bored, bored – Austen loses a bit of her satirical awesomeness in the movie adaptations) and have fun book/movie discussions. Always good to go on trips but always good to be back. I very much understand this. Starting to write up my thoughts on that certain film today, in fact ;-). Thanks, Rachel. Man. what a well-written review here Michael. I really liked Collateral as well. I kept telling people after Denzel did Training Day that Tom Cruise needed to do something different than his normal “betrayed agent on the run” routine. I was glad to see him in Collateral. I appreciate the compliment, T. Great point about Denzel in ‘Training Day’ and Cruise in this — and both doing this kind of work on the streets of L.A. Many thanks, my friend. Collateral takes a premise that is otherwise flawed and makes it into one of the most compelling films I have seen in recent time. I also think a lot of that credit has to go towards Cruise and Foxx giving off some perfect performances, mostly Cruise, who actually had me a tad scared. Good review. Hi, CMrok93. The film certainly is compelling, and those performances by the leads made it so. Thanks for the read and the comment, my friend. I love this movie so much! Personally, I think this is a near-masterpiece but for some reason, it has been wildly underrated ever since it was released. As you said, Mann has a knack for using the city of LA as if it was a character of the movie and he also makes the most of his actors, Cruise in an against type role and Jamie Foxx at his best. We’re both in agreement there, Castor. 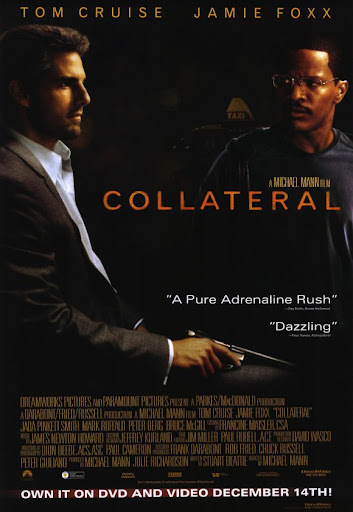 And yes, ‘Collateral’ seems to have dropped from the radar when people mention great Michael Mann films. You know, after having a hell of a wonderful time with ‘Drive’ last year, I think it only enhanced my appreciation of this film when I re-watched recently. Great point and comment, Castor. Thanks so much. Collateral is in my top 100, I’ve always had a thing for dangerous outsiders(Taxi Driver, The Day of The Jackal to name a couple of other favorites). Yeah, that night photography is well-done, as you say Los Angeles becomes a character. For me, at night, there is also this feeling of danger lurking in the shadows, which enhances the suspense of the film. Welcome, Chris. Great to meet another fan of this film and the type of outsiders you’ve named. Your points about the night photography and how its enhanced the ambiance of ‘Collateral’ are well made. Thank you.